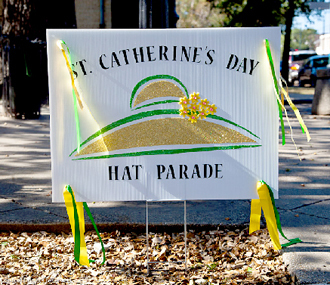 The New Orleans St. Catherine's Day Hat Parade, inspired by the annual event of the same name in Paris, is held the weekend before Thanksgiving. It's open to women and girls of all ages ( as always, men and boys are welcome to tag along). 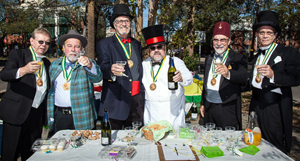 Bring a bottle of bubbly – our Chevaliers du Champagne (below) will pour it into a commemorative glass. Keep participation FREE by donating just $10. Help us pay for LIVE MUSIC, banners, favors, glasses, posters, flyers, prizes,etc. Think of it as really cheap, voluntary Krewe dues. HATS, HATS, HATS! 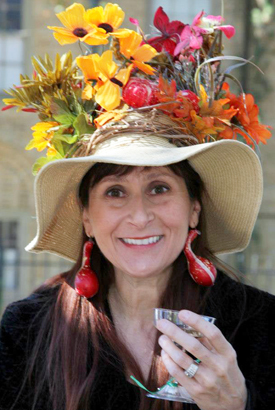 — Create your own hat, or just add decoration to an existing hat. Click on any of the links at the bottom of the page to see examples of creations from previous years. 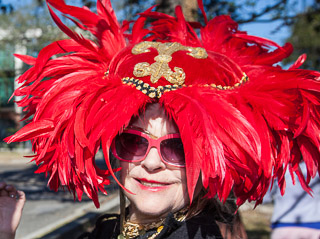 There will be a wide variety of hats in our New Orleans version of the Catherinettes parade. 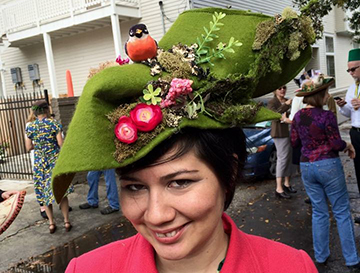 If you have the time to make something special, that's great, but if not, just grab a pretty hat from your own closet — or a silly hat from your Halloween stash — and join us! P.S. 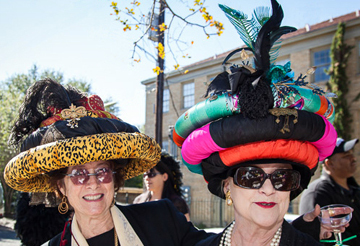 : There's a prize for the Best Hat, and this year's winner will be next year's Grand Marshall. HONOREES — The parade honors an unmarried woman named Catherine (or Katherine...we're flexible on the spelling). 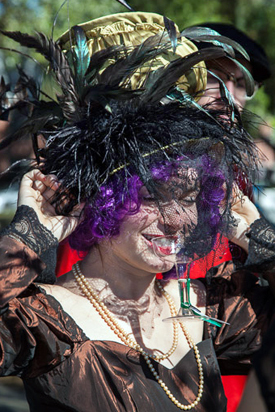 Last year's Best Hat winner, Aryanna Gamble (above), will lead the parade as Grand Marshall. EMAIL any photos (or links to photos) you may want to share. There's LOTS to do, and we'd love to have your input! 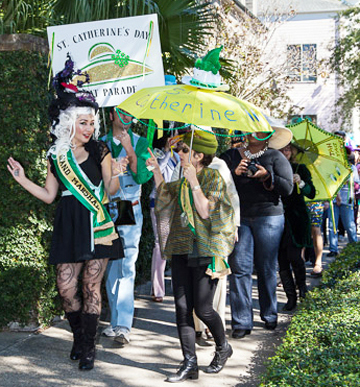 PARADE ROUTE — Meet at 10 AM on the neutral ground at St. Charles Ave. and Pleasant St. 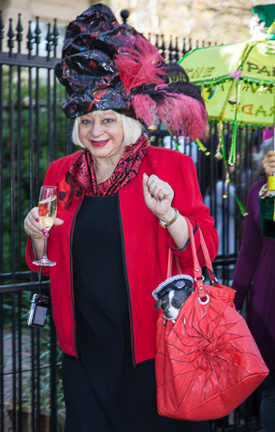 The parade begins at 10:30 AM, walking down St. Charles, and making a series of right turns onto Washington, Prytania, Louisiana, and back onto onto St. Charles to the starting place. The route is less than 1 mile. B.Y.O.B. = Bring Your Own Bubbly! Our "Chevaliers du Champagne" tend coolers with ice to hold champagne (or anything else you bring) so we can celebrate at the end of the parade. Bring a bottle or two to share! 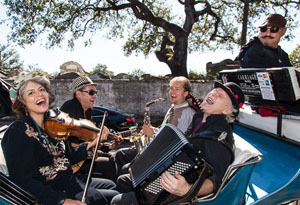 LIVE MUSIC — Bart Ramsey and members of Zazou City accompanied the 2014 parade in a mule-drawn carriage. We already have them locked in for 2015! CLICK HERE for a preview of the sound. HISTORY — St. Catherine of Alexandria was an early Christian martyr. She is the patron saint of milliners, seamstresses and unmarried women. On the feast of St. Catherine (November 25th), French seamstresses, milliners and unmarried women (called Catherinettes, pronounced the French way: kat-reen-ette) parade the streets of Paris showing off unusual handmade chapeaux using the traditional colors yellow (faith) and green (wisdom). The hats range from pretty ... to silly ... to elegant ... to bizarre. We are recreating that event here in New Orleans. For more information, contact Claudia Lynch at info@HatNola.com. All photos copyright the artists.